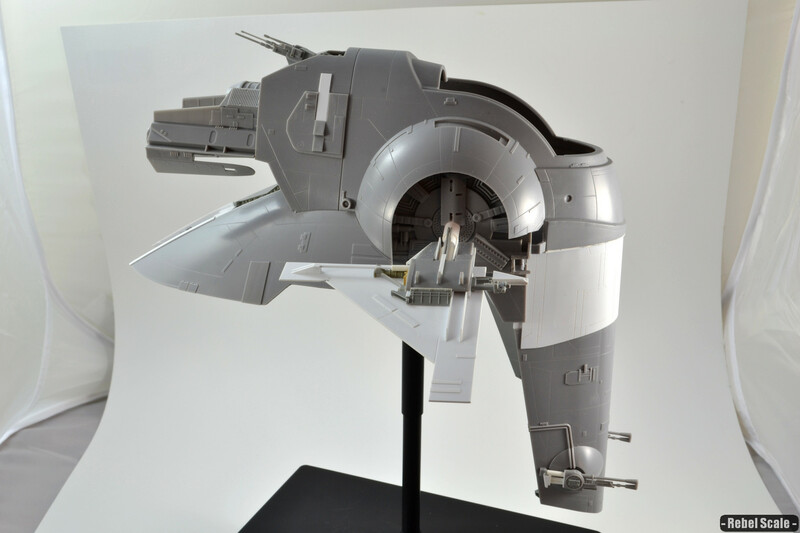 This is a kit-bash of the Fine Molds 1/72 Jango Slave I. 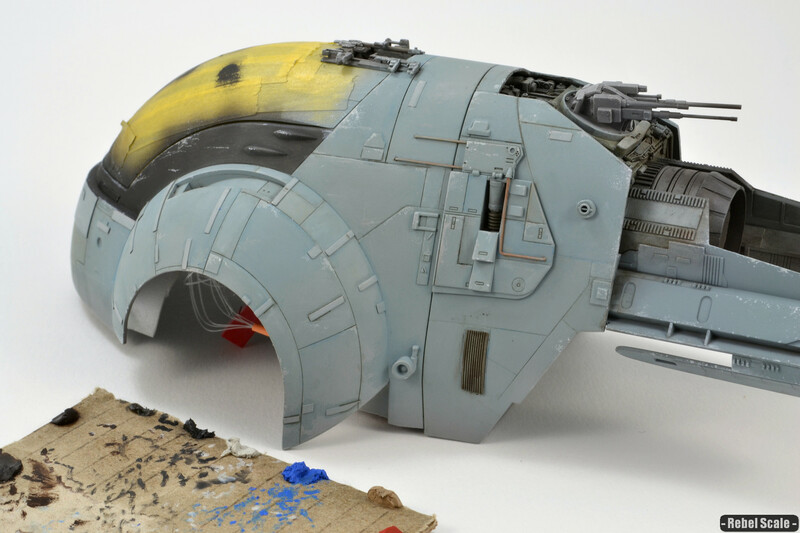 As usual, the main Shrike Build log is located at Keeper of the Force and includes all the pics and steps seen here. Assembled hull pieces (not yet glued). 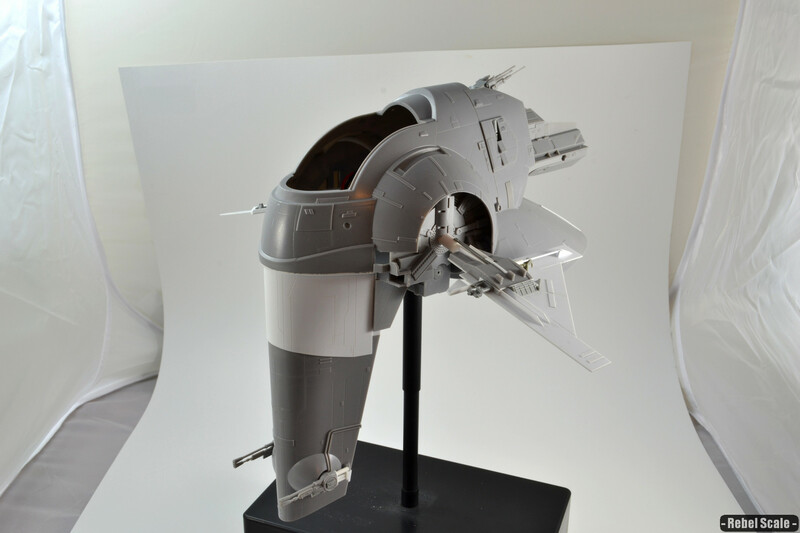 The white styrene piece on the nose is one solid piece that I had to cut out, scribe the panel lines, and then glue to the hull. 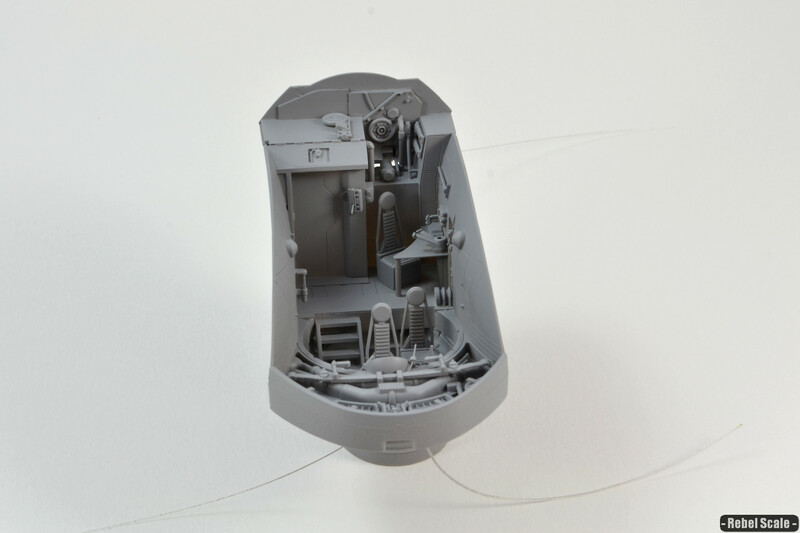 Hull parts and internal wiring. 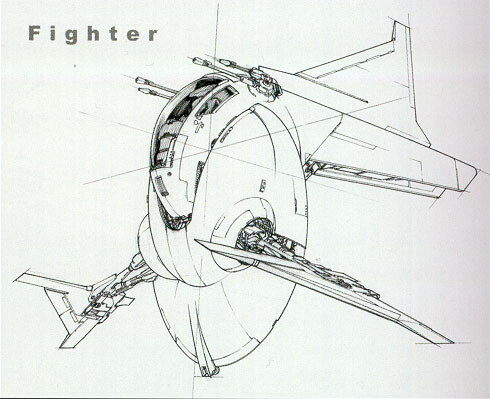 There are 3 thrusters. 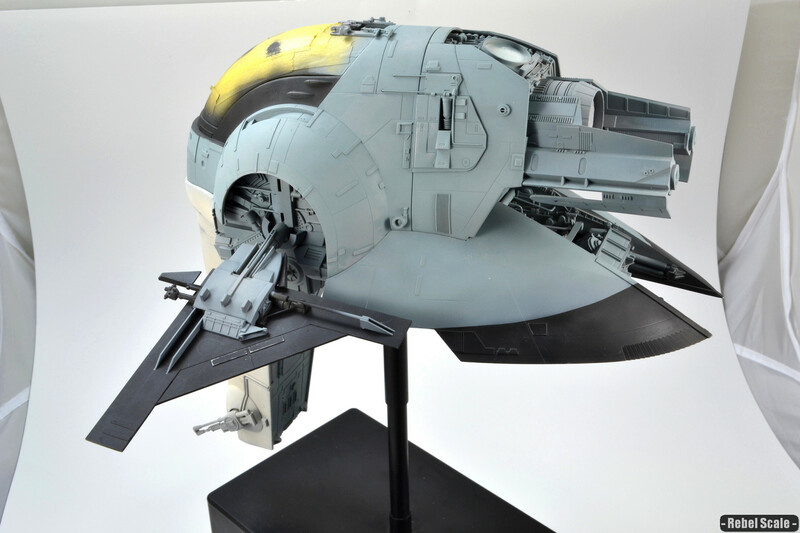 Each small one is made from the wing parts of the Slave I. 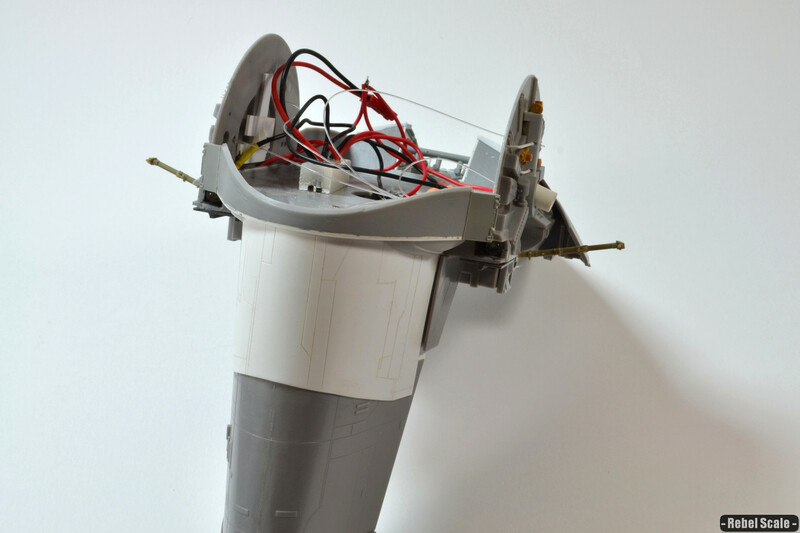 The large thruster has 3 LEDs lighting it, while the smaller ones have 1 LED. Also, you can see a lot of the greeblies I've added to the rear. 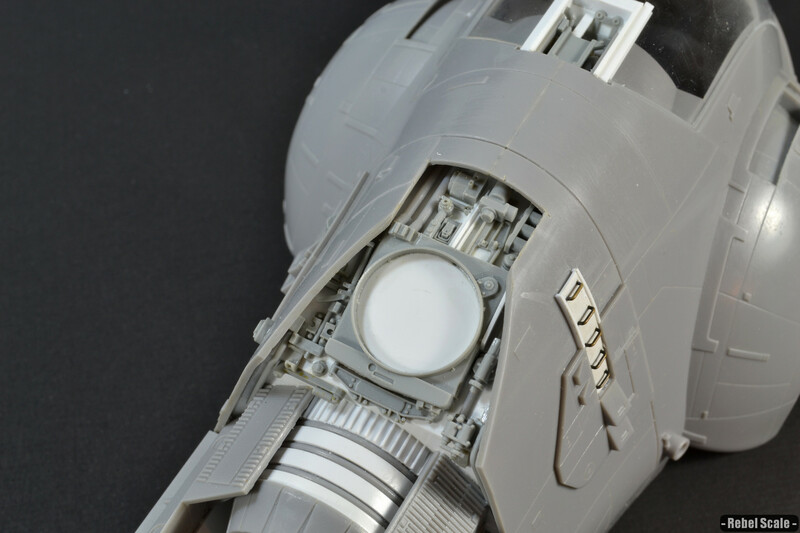 I originally cut out that chunk because I wanted another big thruster under the main one, but I couldn't make it look quite right. So in the end, I built up the area with more detail. Here it is on the stand. You can also see the wings I made. These are pointing backward from the concept art, but I like the look. Another shot. 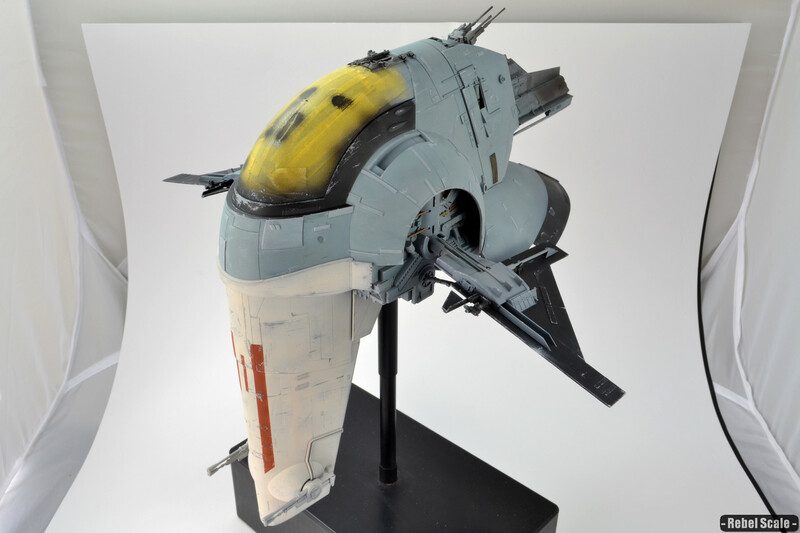 This gives you a good idea of the profile of the ship. Here's the cockpit. 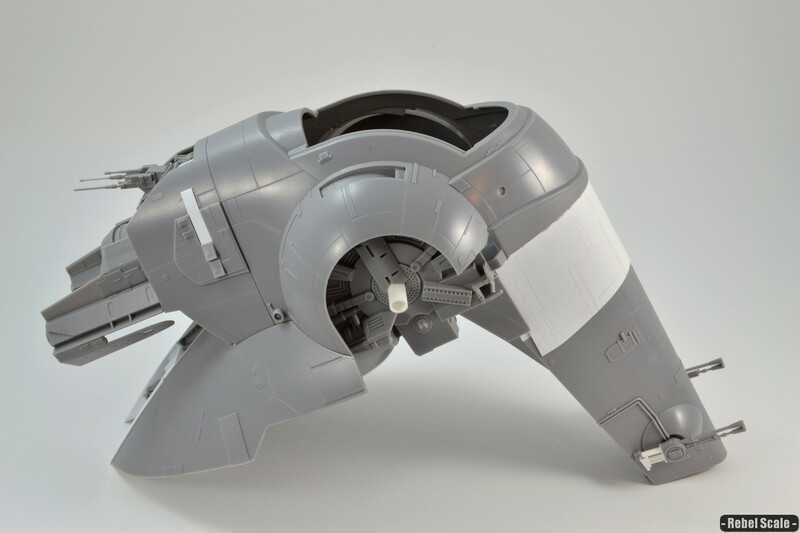 I used the base parts from the kit and just added a lot of detail. I've drilled several holes for fiber (some I installed), but I think I will add most of it after I paint it. I added grabhandles to the side as some kind of maintenance access thing. I used the Grabhandler, which allows you to recreate grabhandles at precise sizes. I used the first one as a guide, mashing the sharpened ends into the plastic strip, then drilling out the holes. The final grabhandles were dunked into a brass burnishing fluid that darkened the metal and made it ready for painting. Here's a closer shot of the wings. You can see the details better. Using channels and strips, I added detail around the main engine. I cut about 50 channel bits and glued them around the engines with similarly-sized strips in between to make it look gear-like. 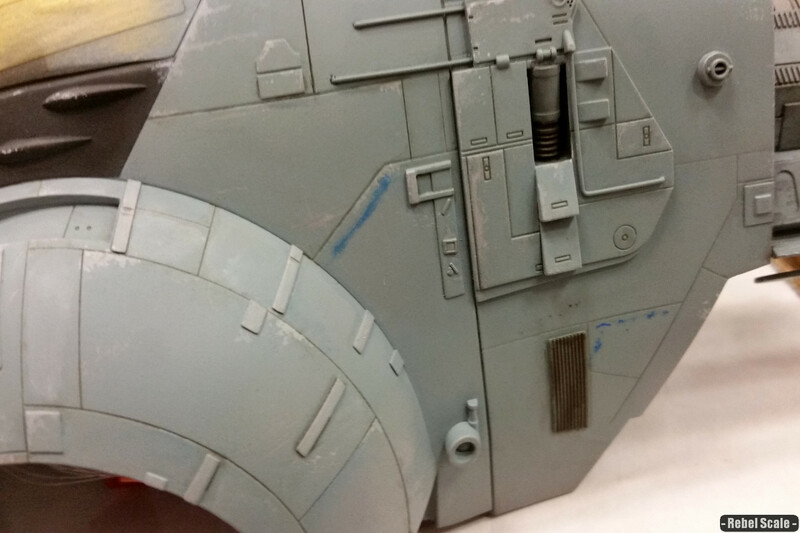 Also added more detail to the gun turret. 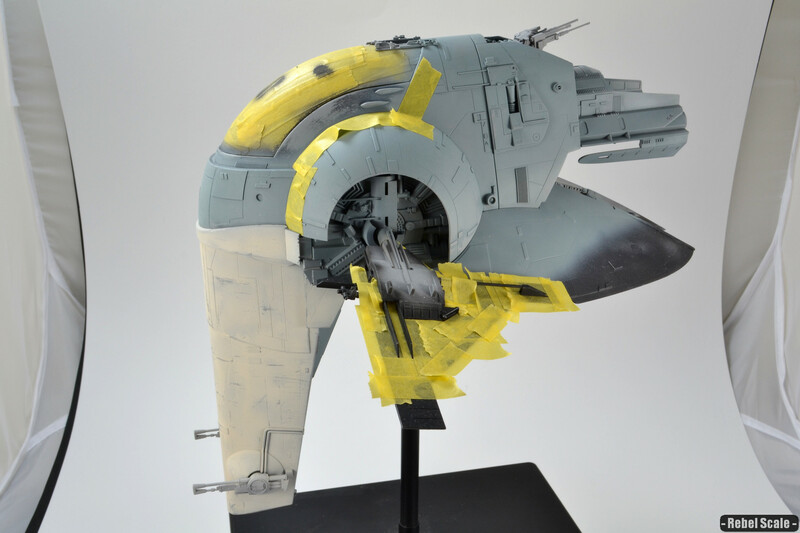 In an effort to make it less like the Slave I, I decided to modify the clear canopy by cutting part of it out and creating a channel for the canopy to slide into. 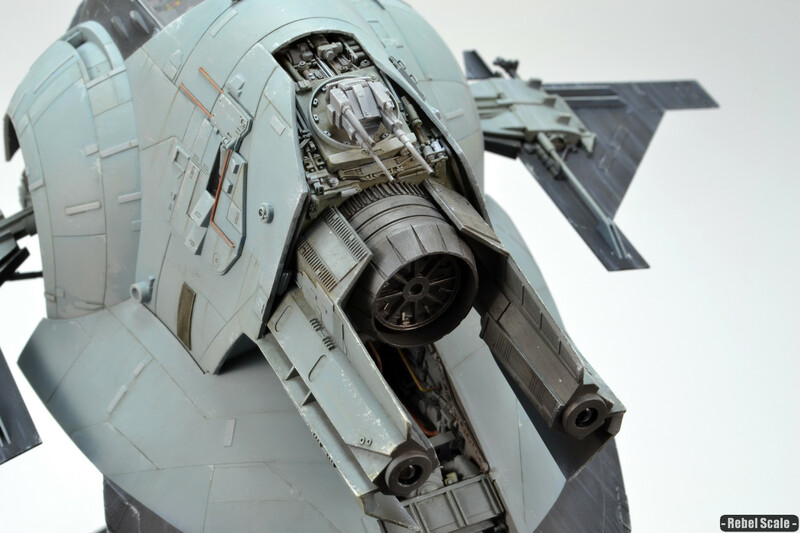 Because glue/cement can craze clear parts, I hope to have the canopy slide on and off without anything added to it. So, I wanted to get another shot of the rear with all the greeblies intact. I will still probably end up adding a few more here and there. 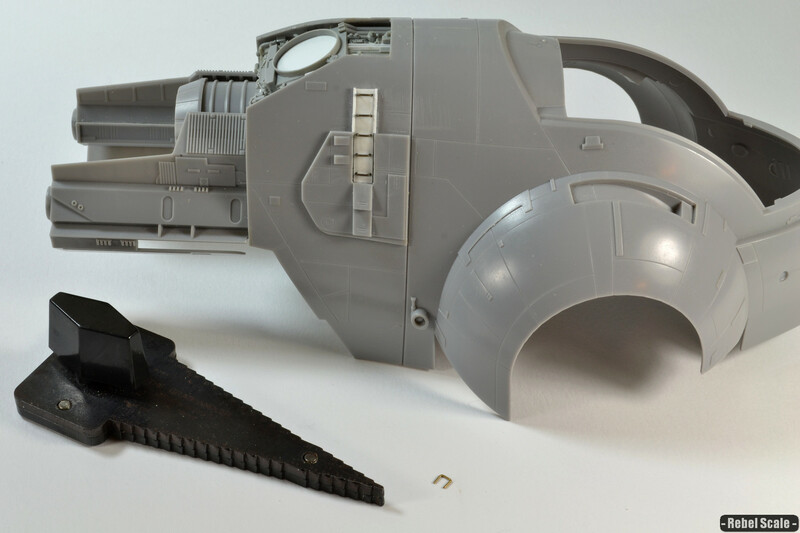 Finally, this is where I'm at with the forward section that will hold the canopy. 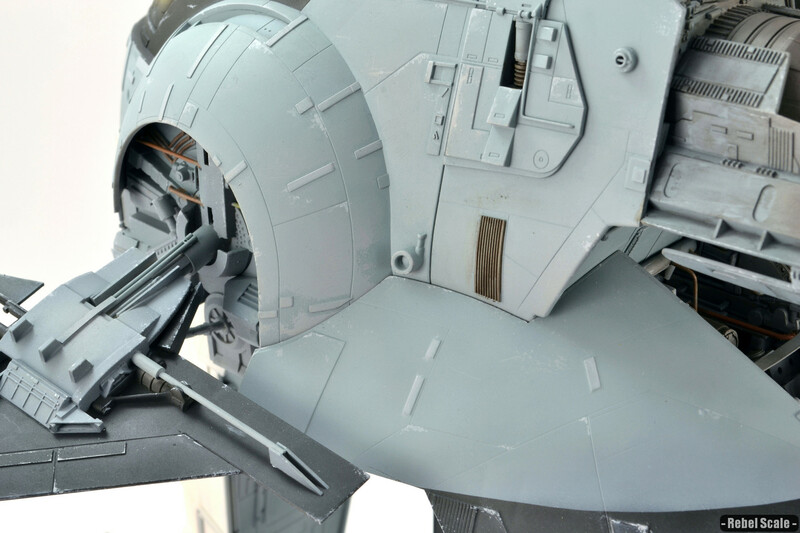 The canopy is currently removable via sliding along the rails. I'm planning to add sensor array details to this area...even building up some of the area around the white styrene that I've added so far. Here is the finished sensor array. You can see a lot of greeblies, including a little sensor dish on the side. 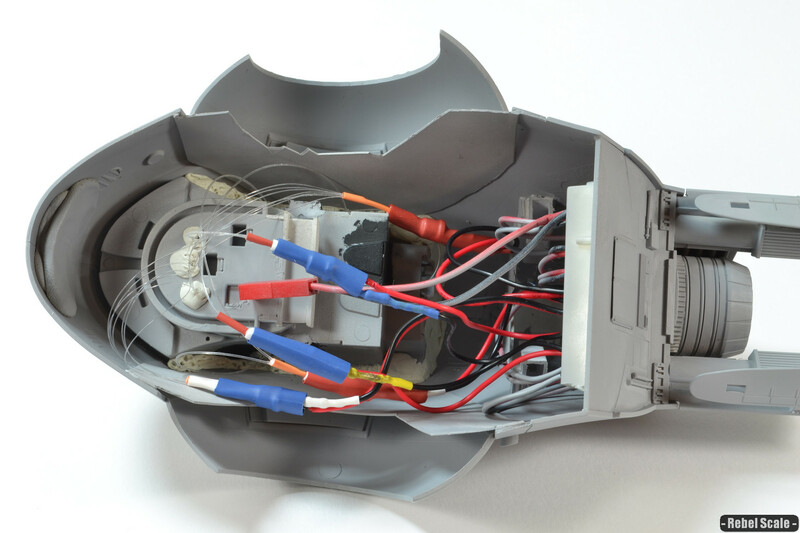 This is a shot of the wiring on the inside, as well as showing off the added floodlights, located on either side of the widest section of the ship. The bars are almost pointing at them. 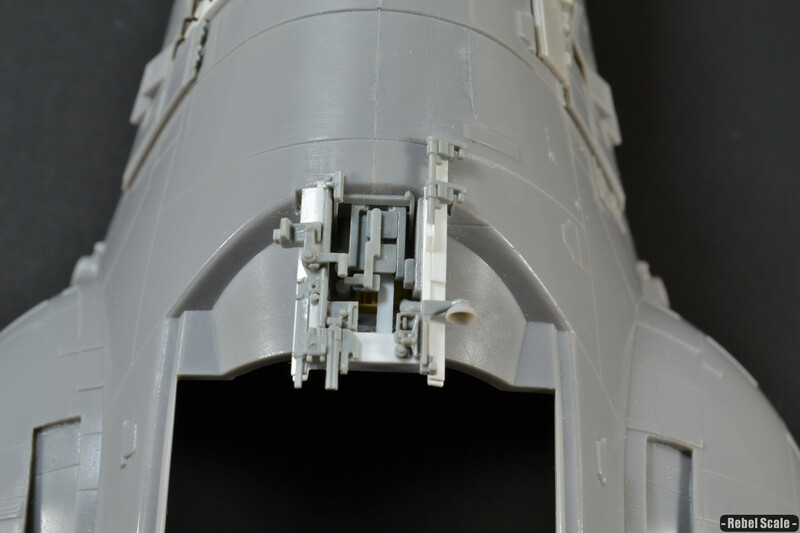 These bars are stabilizers for the wings and are made from 1/48 Fw 190 landing gear from an Eduard kit. 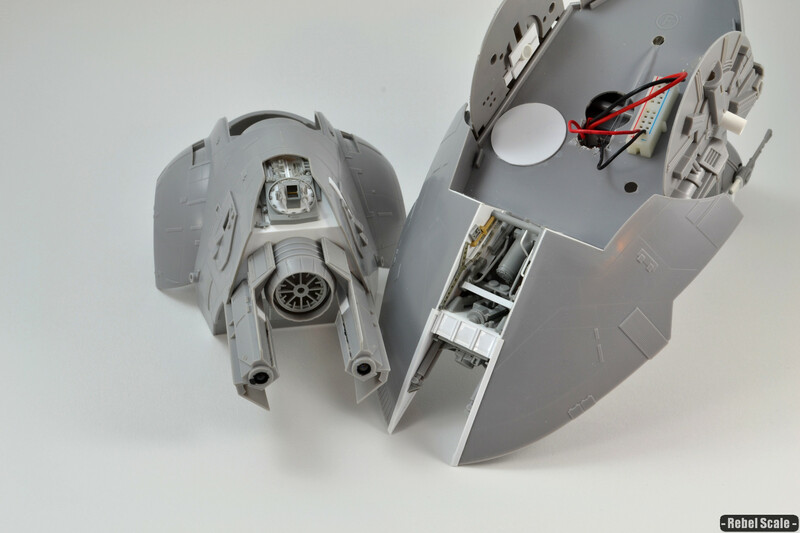 Here is the underside view, as well as a push-button latching switch. Latching means that you press it once for one; press it again for off. Momentary switches (the more common push button types) only allow current when the button is down. I wanted something that I could push and leave if I wished. 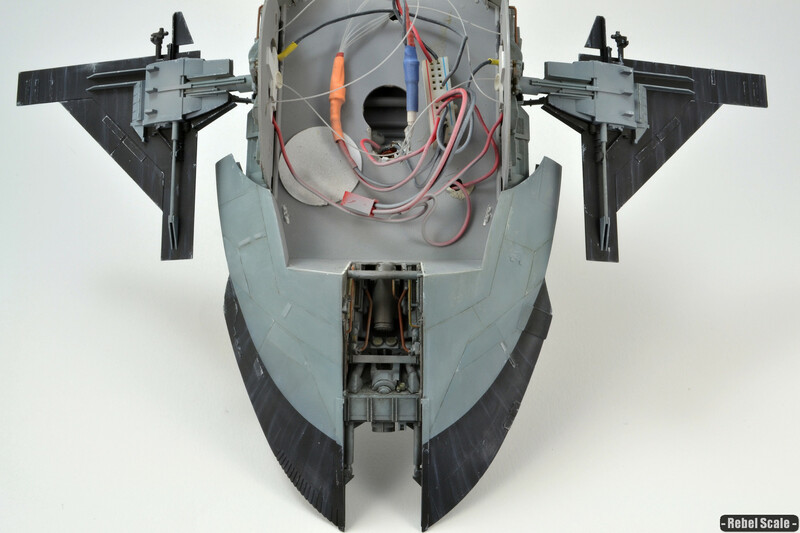 Fiber optics in the upper hull. 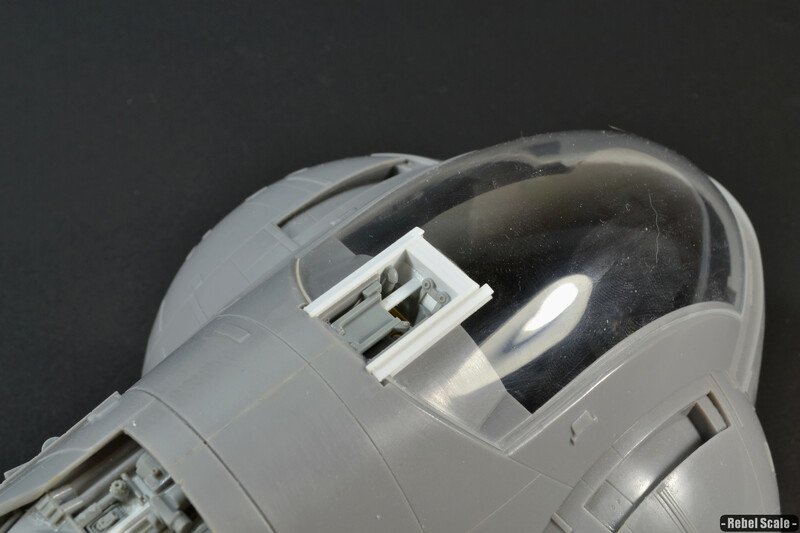 I connected the fiber to the cockpit with white glue, then added Apoxie Sculpt over the drilled holes to block light. 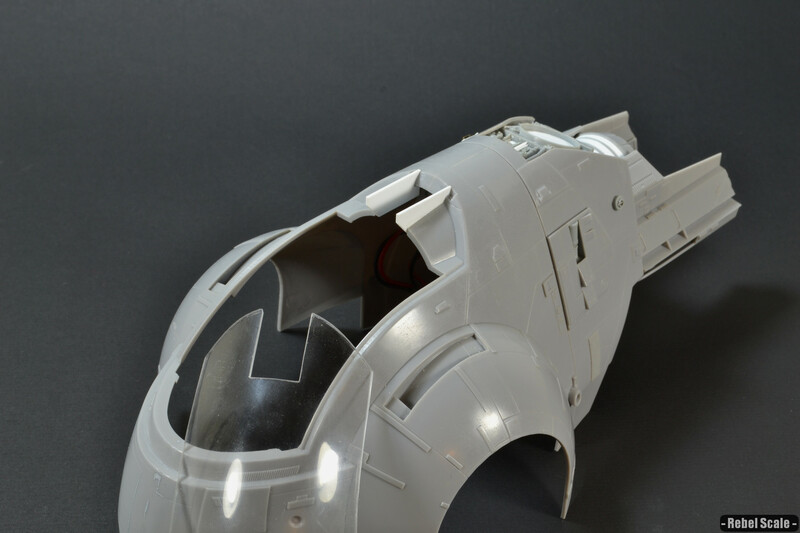 Also, even without the cockpit mods, the cockpit tub doesn't fit well to the model, so I added a lot of Apoxie Sculpt to the edges for reinforcement and light blocking. 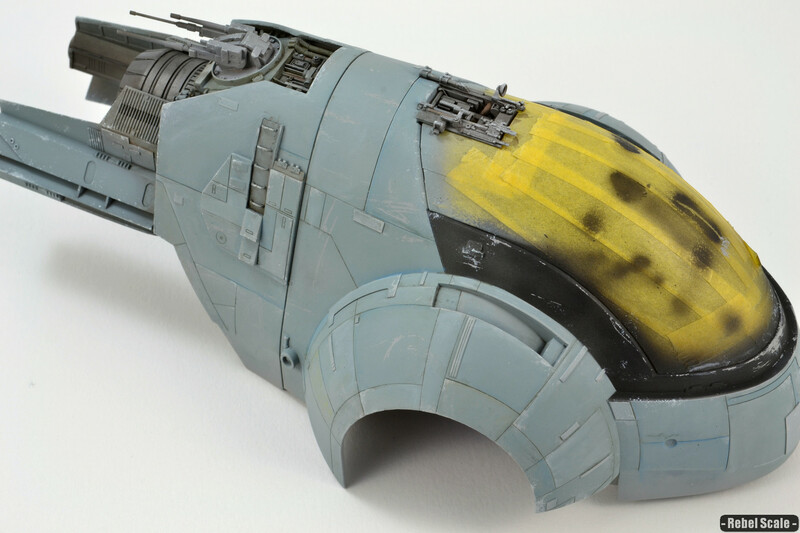 So, here's the money shot: the painted cockpit. It's mostly a lot of grey with green/grey chairs. The lights will add more interest, but I also intend to weather the whole thing some more with oils and enamels. Also, I added the Mandalorian helmet and jetpack. I actually made a resin mold of the helmet and used a resin copy just in case I want to use a 1/72 Mando helmet in another project. 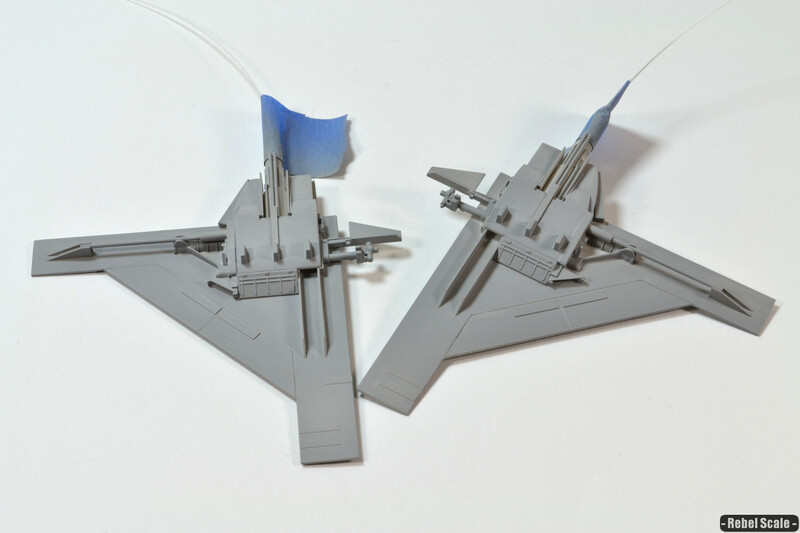 A little less interesting, this is a shot of the primed wings. 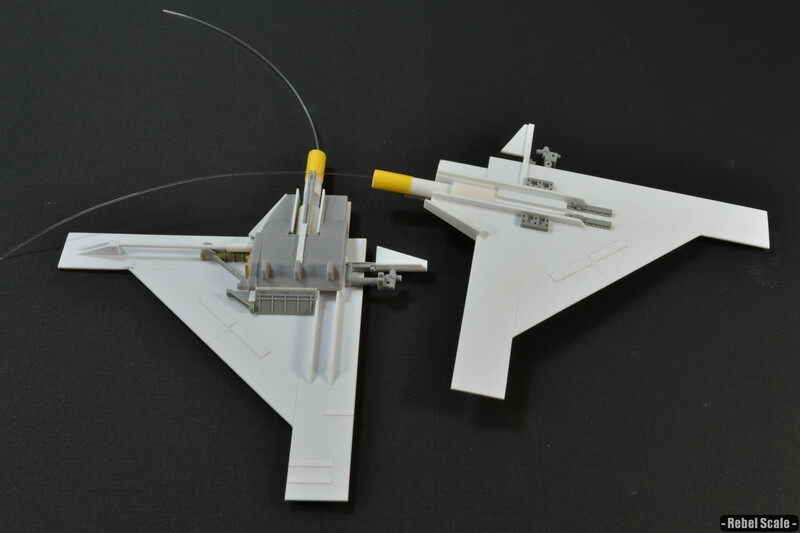 I used some Blue-Tack to cover the fiber optic ends hidden in the wings. Finally, here's the figure, a female pilot, black hair with green streaks. I need to repaint some areas. By the way, this was Jango Fett, but I added hair and breast-ly areas. I opted for sloped armor over simply breast-cups that seem...over the top for armor. I'd rather go for feminine, but not slave Leia. Besides, like this, she looks like Bo-Katan. For the initial airbrushing, I opted to copy the avian form of the shrike as best as I could. The hairspray chipping worked a little too well, so I removed most of the paint and airbrushed it again later. This resulted in some neat chipping effects. The dark grey chips are hairspray chips down to the primer. 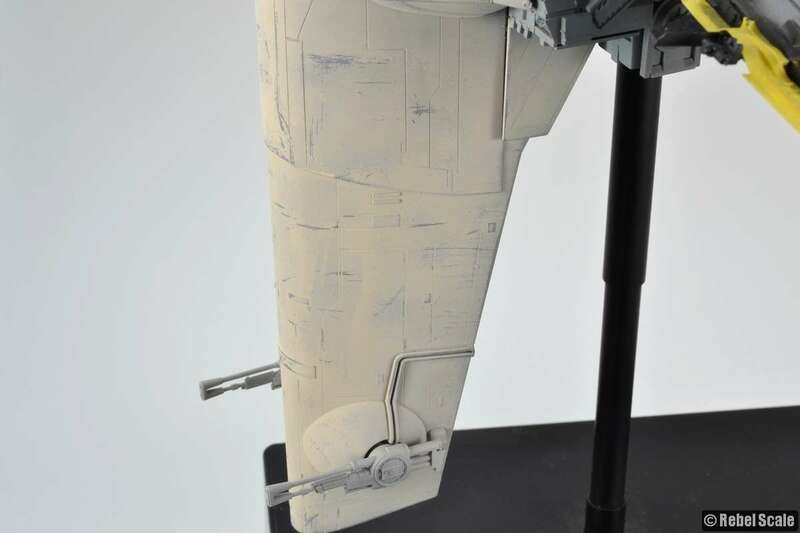 There are also lighter chips underneath the off-white paint, which are just slightly visible, but create neat contrast. Sprayed the black on in uneven coats. The goal was to make it look worn, so there's no need to get complete coverage. The curves on the back were created by placing two pieces of Tamiya tape back to back, then free-scoring a curved line with my Xacto. Peel the tape and place for perfectly symmetrical curves. Finally, I added some asymmetrical orange lines to the front. They are slightly off-center but look fierce to me. 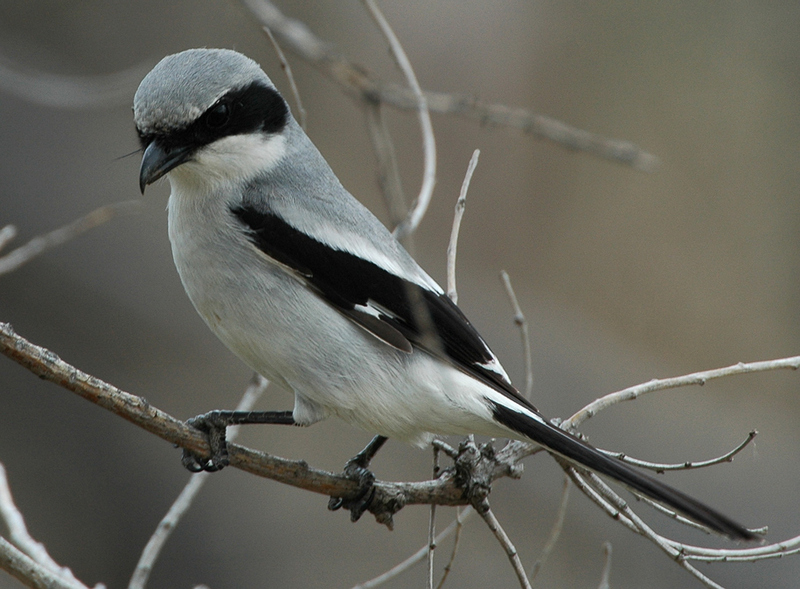 Plus, there are some shrikes that have rusty lines on their breasts. 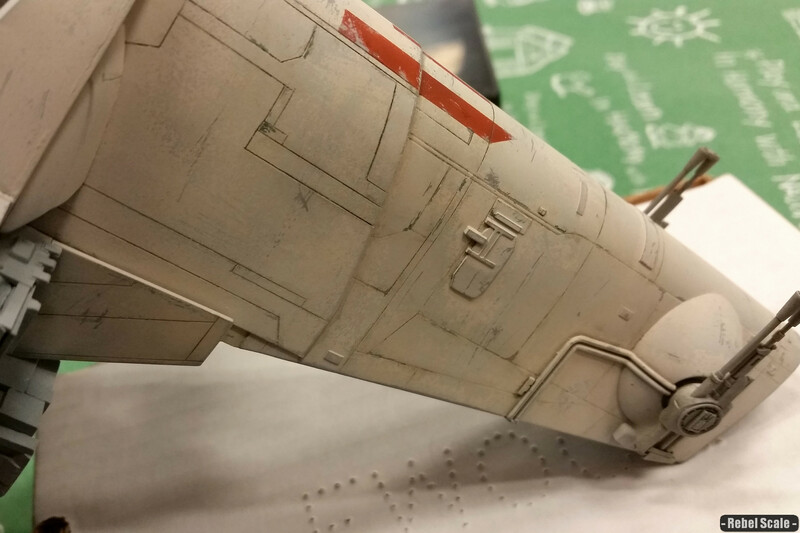 I am contemplating adding more white patches to the wings and/or rusty orange patches to the upper hull. Here we are at the chipping stage. I used light grey Vallejo paint and a sponge to create small irregular chips, then I went back in with a brush to make larger chips. I also spent some time using highly thinned Life Color greys (and some Tensocrome paints) to highlight panels. You can see the highlighting better here. Essentially, I made a filter with acrylics. Acrylic filters are hard to control on large surfaces but work well on small, raised panels. For this, I used a flat brush and removed some of the paint by blotting a paper towel before brushing it on (so it won't pool on the panel). Note: this isn't dry-brushing, but the effects can be similar. 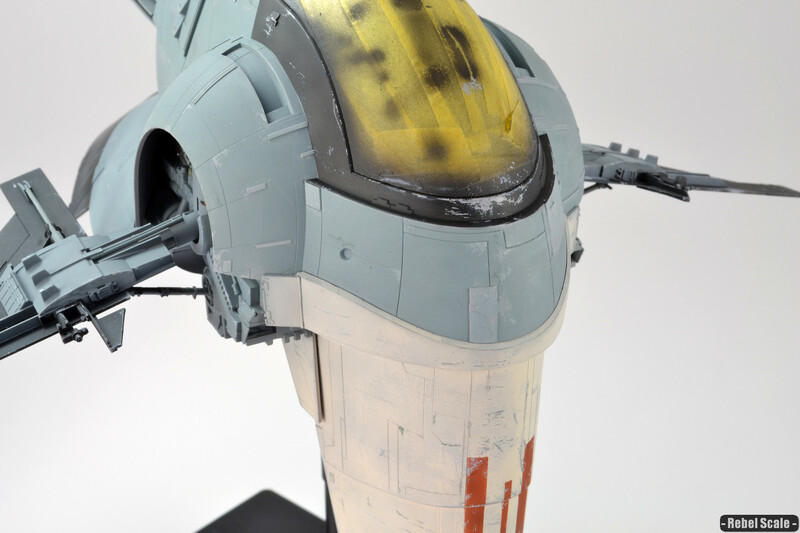 Another shot of the front, forgive the hair on the nose-panel. 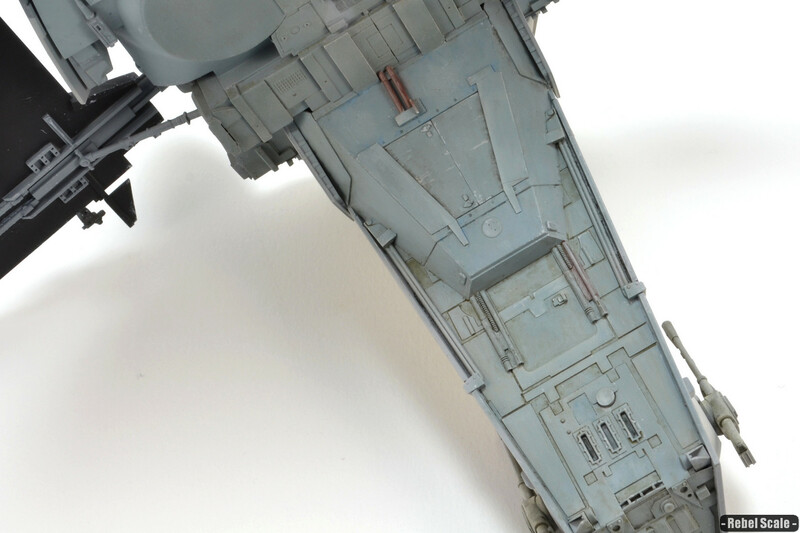 You can also see different colors of chipping that contrast with the highlighted panels. 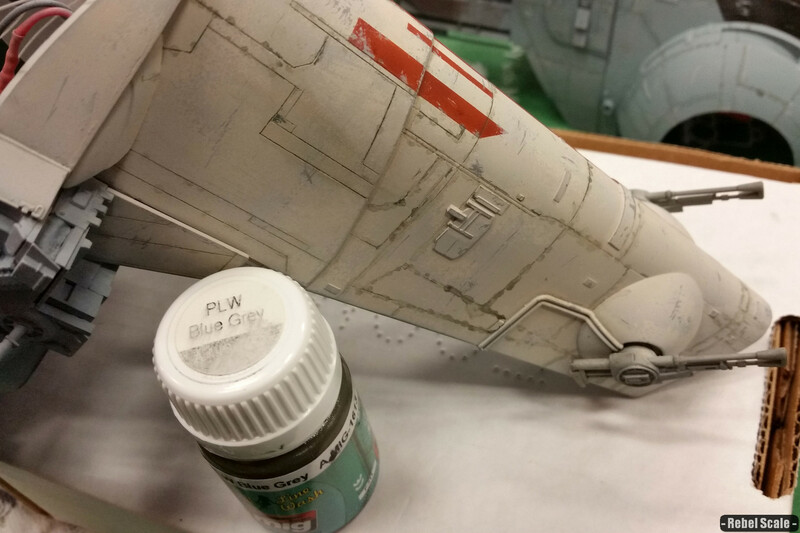 Here I've started the enamel weathering process by adding Mig Ammo Blue/Grey wash with a fine brush. After a few minutes, I got back and removed the excess with a brush dampened with odorless mineral spirits. 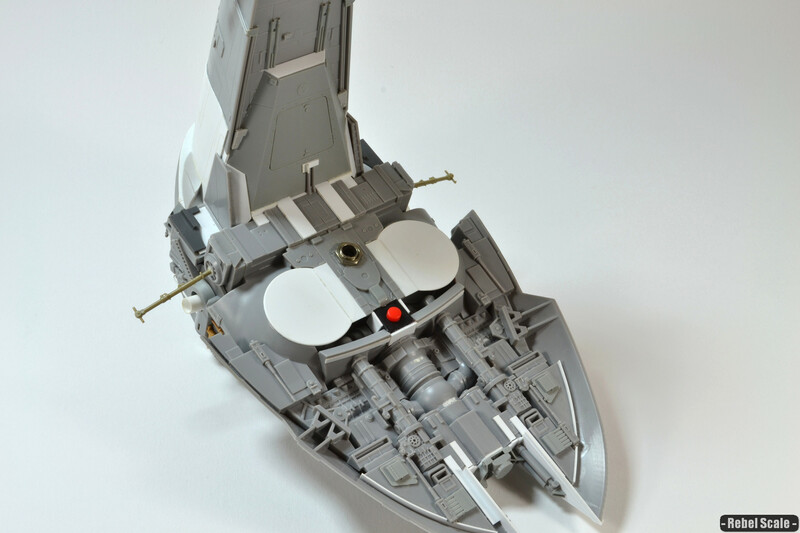 This darkens not only the panel lines but the area right next to the lines as well. You'll also notice that it surrounds paint chips, be they recessed or raised (painted on) chips and creates a false sense of depth. In other words, a wash or filter makes paint chips look more real. Now I use AK Interactive Salt Streaks (a white enamel solution) in the middle of the panels to bring back some of the highlights and make some of the panels stand out a bit more. To make each panel stand out, I use oil paints in what is called Oil Paint Rendering or what I call paneling. In this case, I am rendering shadows and highlights. Blue oil paint is great for making soft shadows, and a light grey is nice for highlights. I also throw in some tan on a few panels to make them even more unique. Here you can see the effects of all my efforts. Panels have slightly different gradients of color. Having a shadow panel next to a highlight makes them both stand out. The raised panels were painted with acrylics, but everything else was oil rendered. Also, notice the orange wires/hoses and grill below were painted with oils. More OPR. I try to use dark browns and blacks only for grease or intense shadows, as they can overpower panels if used for general shadowing. Here I've added white streaks to the black areas using Salt Streaks. 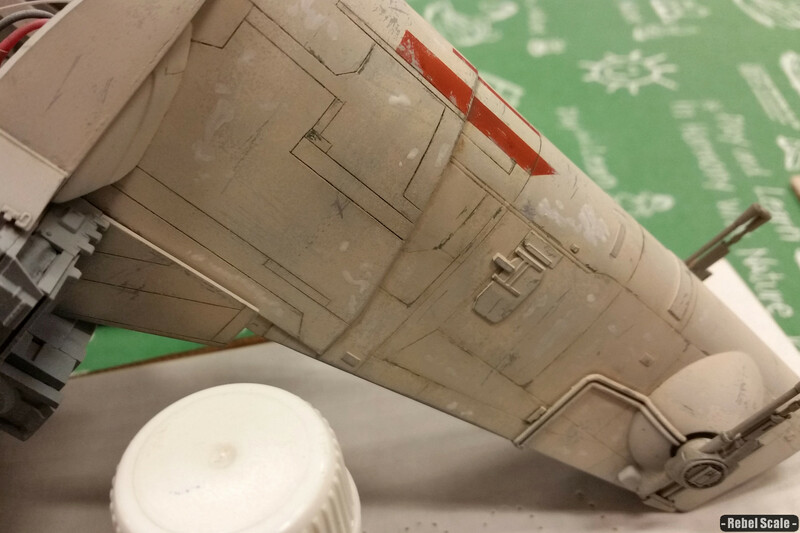 Again, I save my white paint for streaks rather than general highlights, as white is usually too strong. Here is the main crew entry point. I used brown oil to over-emphasize the doors. I also used Mig Ammo washes to create tints in the recessed areas. 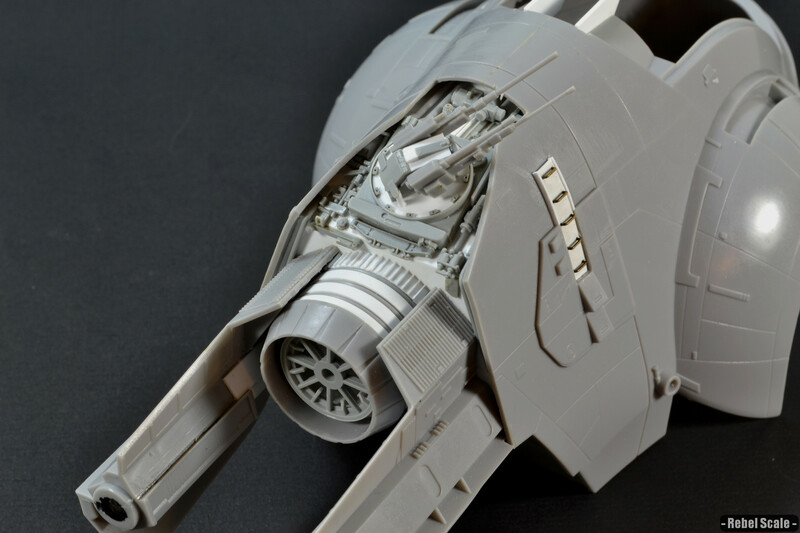 The idea is that the craft will land with part of the nose hanging off the platform. 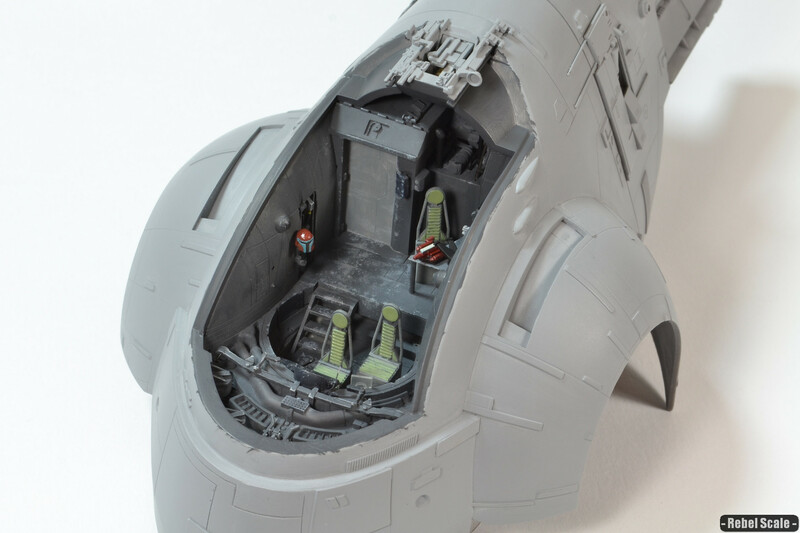 Landing gear will extend from above/behind the door, and a ramp will extend from the door area. 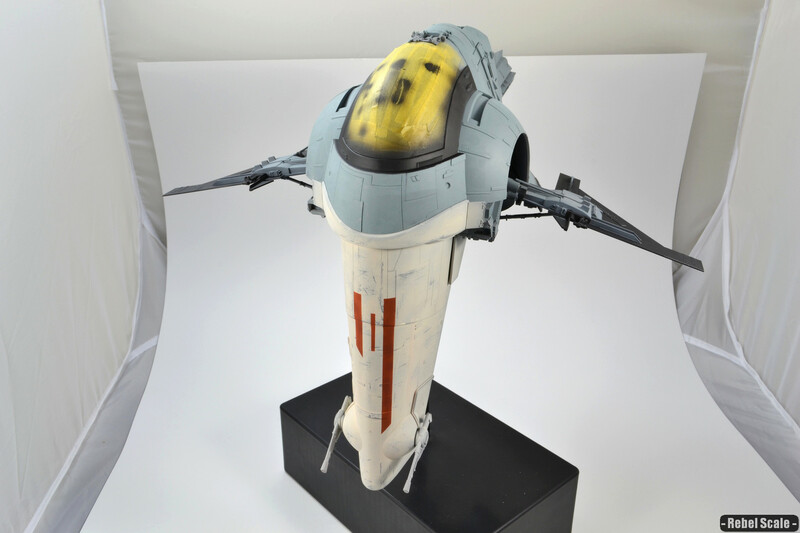 The final area I painted was the engines using Vallejo Metal Color Jet Exhaust. 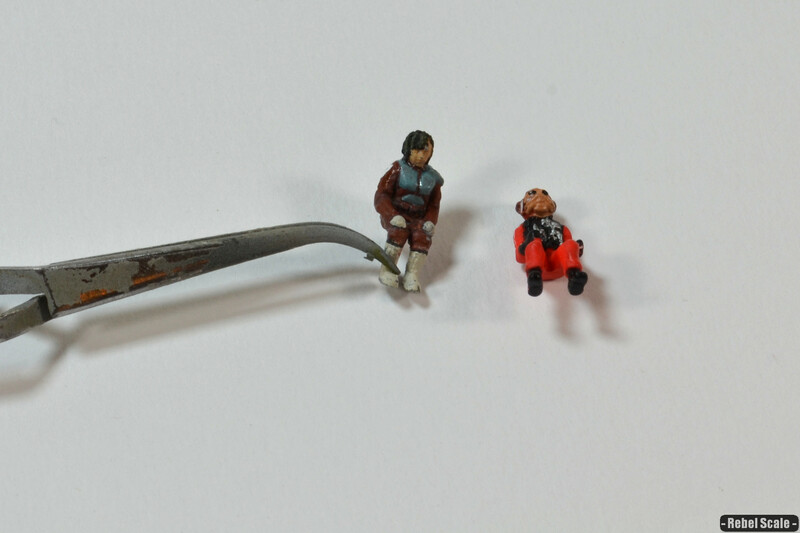 The Metal colors looks exceptional for acrylics and have a nice metallic sheen. The outer engines are not as shiny since I added a flat coat, but I repainted the inner engines, which still has the metallic shimmer.